Finding the Words, Finding the Ways, developed by the California Center for Infant-Family and Early Childhood Mental Health at the WestEd Center for Prevention and Early Intervention, is designed for professionals responsible for the support, professional development, and oversight of those who work with infants, young children, and their families. Professional groups and organizations have widely promoted and described the Reflective Supervision Model; however, capturing the essence of this proven practice on the written page has been difficult. This DVD is a response to a widely expressed need to see and hear effective reflective supervision in action. The unscripted vignettes feature experienced supervisors and practitioners drawn from a variety of infant and early childhood programs. Through improvisation, the participants demonstrate typical supervisory processes, dynamics, and concerns. 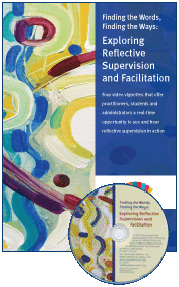 An accompanying manual provides an overview of supervision strategies, plus ideas for using the DVD in training settings and as part of professional development activities. This report, prepared by REL West, examines California's efforts to foster preservice preparation of early intervention assistants for infants and toddlers with special needs through the Community College Personnel Preparation Project, a certificate program offered by participating community colleges. A two-page synopsis of the report, California's Approach to Training Early Intervention Assistants, is also available. Early Start Online Institutes, Special Topic Trainings, and WebinarsLearn how to build competencies for Early Start service coordinators and early intervention service providers so they can effectively serve infants and toddlers with disabilities and their families.